Wisdom of Life. : Are you an understanding father? One of my Indian girl friends recommended me to see a Tamil Indian Love movie. Although it was a romance show, it highlighted greatly on family love and matters. It was a film that depicted our current society problems. The story was about love given from the father to the children in the wrong way. His children were over pampered when they had lost their right to think and to decide. From the time the children were born, everything was pre arranged and planned accordingly. The father was successful and extremely rich who could afford almost everything for the children. Without him realising, he controlled and dictated his loved one. His wife and the rest of his family had no say at home. They could only listen and follow the father words. They live in silence frustration and won't darn to sound a word of disagreement for fear of the father. In actual fact, the entire family wasn't happy at all. There was no laugh and cheer in the house, until the son's lover appeared to create the needed joy of love for the whole family later. Although it was only a film show but I believe many fathers out there could have make the same mistakes. Is good to love our children and to provide for the family but not to love and possess them forever. Guide them, motivate them and advise them. Lead them to be independence and love them to love others. This is the role of a successful father. On the hand, to love a lady is different. As man we try to love our mate until she needs not think for herself. My little darling always said, "Yes sweetheart...I am brainless since I know you!" 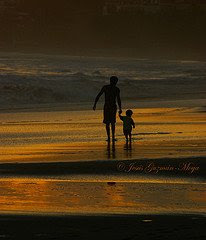 Food for the heart - "Be a great father, love your family with a true heart without condition and expectation."